In the course of their labors, the members of a General Congregation have many occasions to cast votes. At times, there is need of electing someone. However, most votes are about propositions on texts, which if adopted, become part of the norms to guide the Society of Jesus in the years ahead. For the first time, a large part of the votes is happening digitally using the tablets. The tablets have been programmed specifically for use in the 36th General Congregation. For example, suppose there was a proposition that reinforces the participation of Jesuits in their work with refugees. After the presentation and a time for discussion, the proposition is projected on giant screens and diffused on the tablets of the members of the assembly. At the bottom of the text there is the option to vote “for” or “against”. The vote is taken and the result is posted at on the principal screen. For the election to certain positions, whether for service to the Congregation itself or for the choice of assistants to Father General, it is possible to provide a list of names of “candidates”. At times, the voting is taking place using traditional paper ballots. On other occasions, electronic voting is used, and results are obtained almost instantly. For the election of the Father General, however, the procedure follows exactly what Saint Ignatius himself prescribes in the Constitutions of the Society. The election happens only after the period of prayer and reflection, the four days of murmuratio. 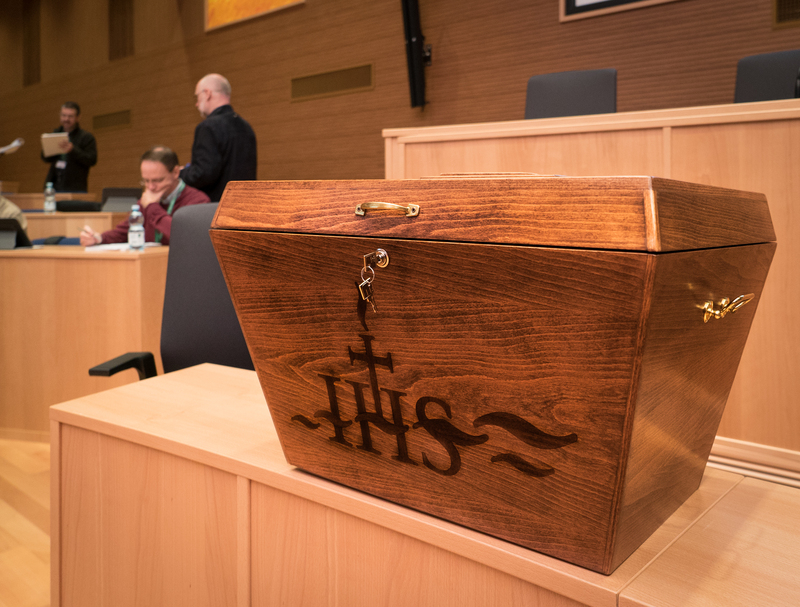 On Election Day, after the celebration of the Mass of the Holy Spirit, the electors meet in the aula for the beginning of the vote. Each elector receives a paper ballot on which on one side is printed an oath which states that the undersigned “swears that he is voting for the one who, in his opinion in the Lord, is the one most capable of exercising this office”. The elector signs the oath and then, on the opposite side, writes the name of the one for whom he is voting. The way the ballot is folded gives assurance that, at the moment of counting the votes, one can read the name of the one being voted for without being able to identify the one who is casting the vote. The ballots are read out loudly, one by one, by the Vicar General (the one who has taken the place of the General during the interim between Generals) and by two scrutineers. No one is allowed to vote for himself. The one who gets 50% of the votes plus one is elected. For the present election, 107 votes are needed since there are 212 electors.